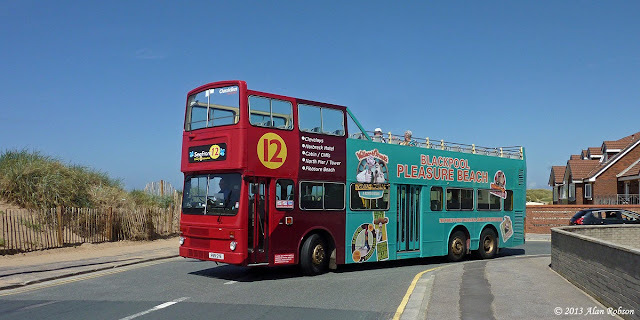 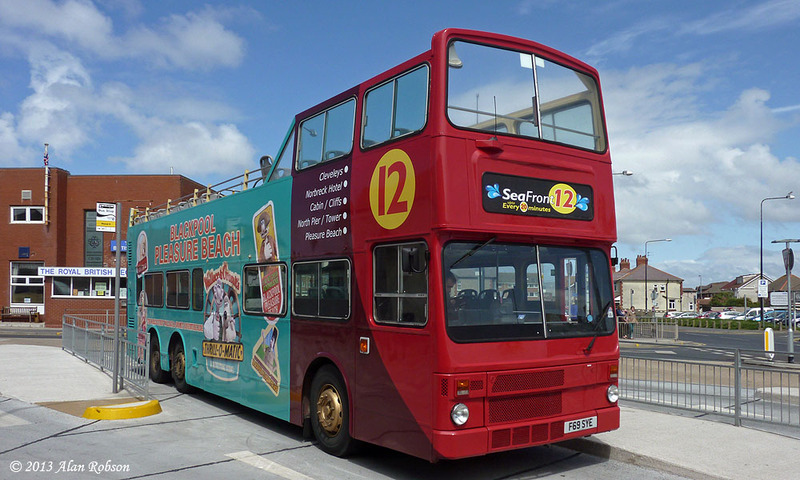 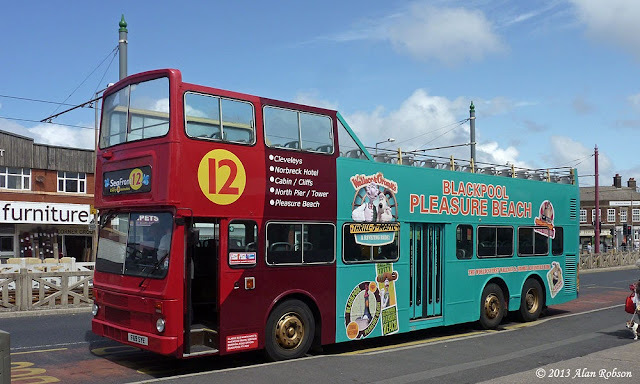 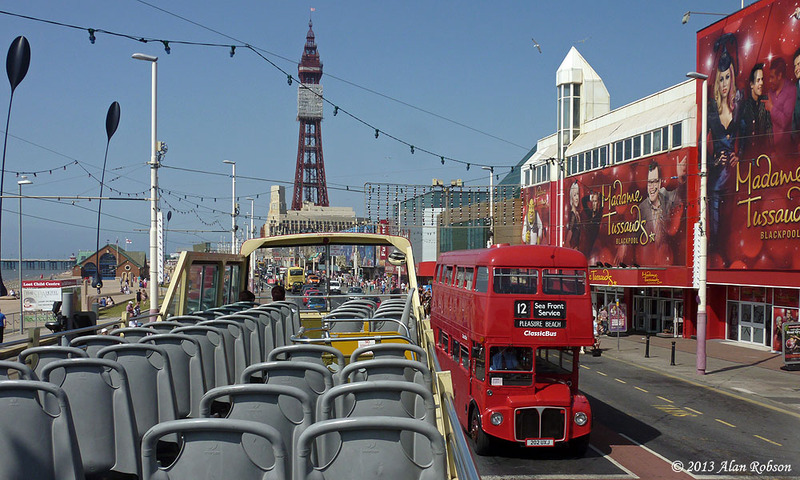 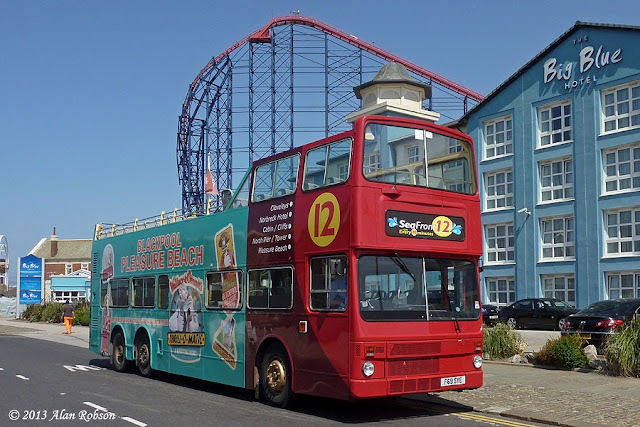 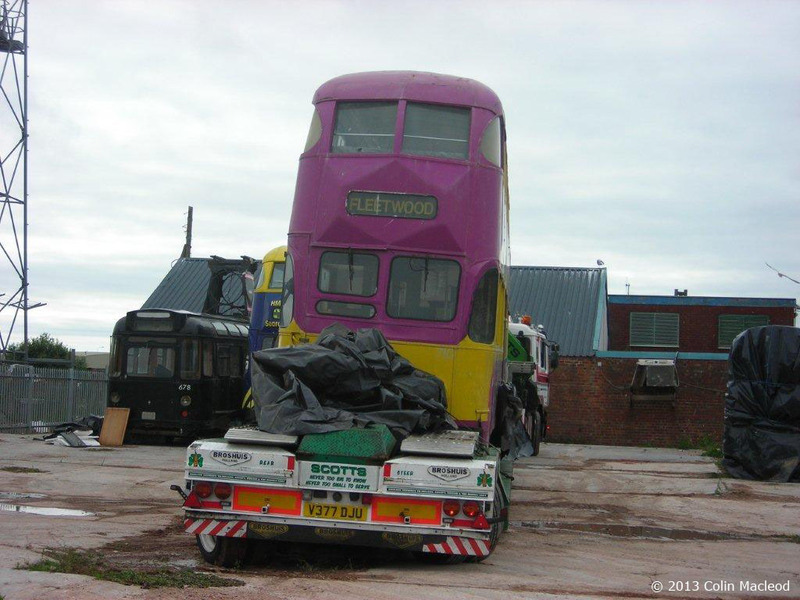 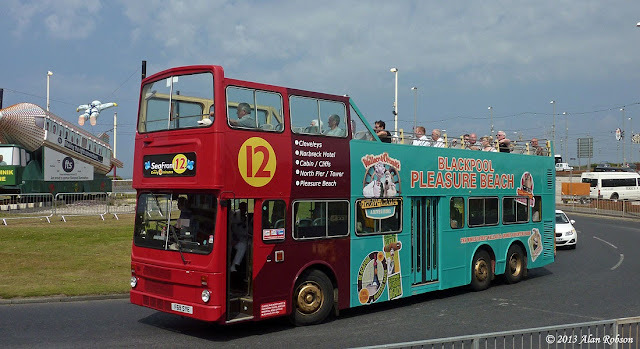 The Seafront 12 service of Classic Bus North West had its route extended southwards from the Pleasure Beach to St Annes on 20th July. 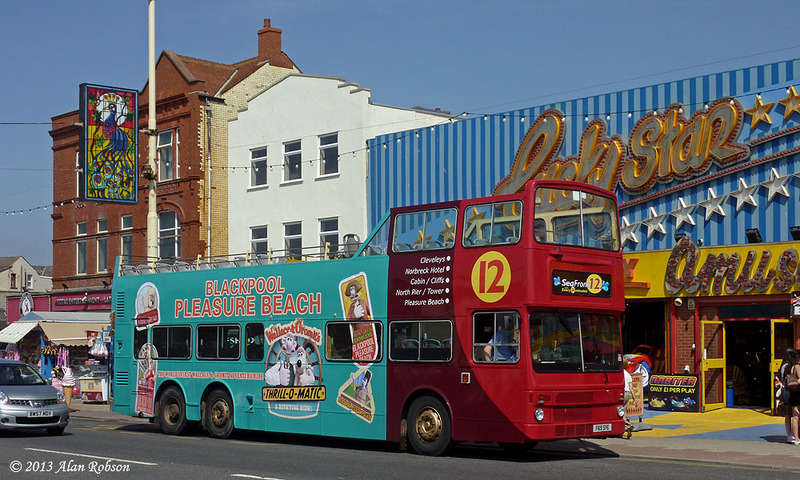 After leaving the Blackpool boundary at Starr Gate, the route continues south along Clifton Drive North past the sandhills. 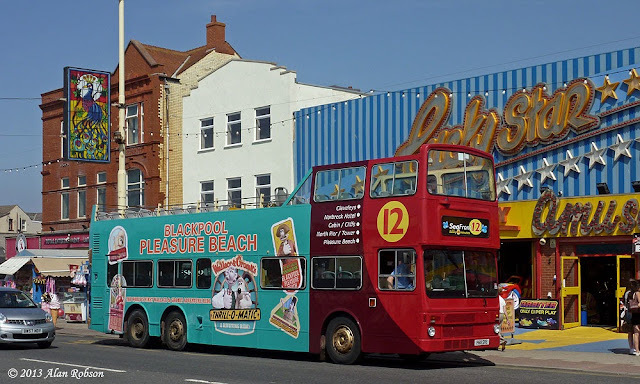 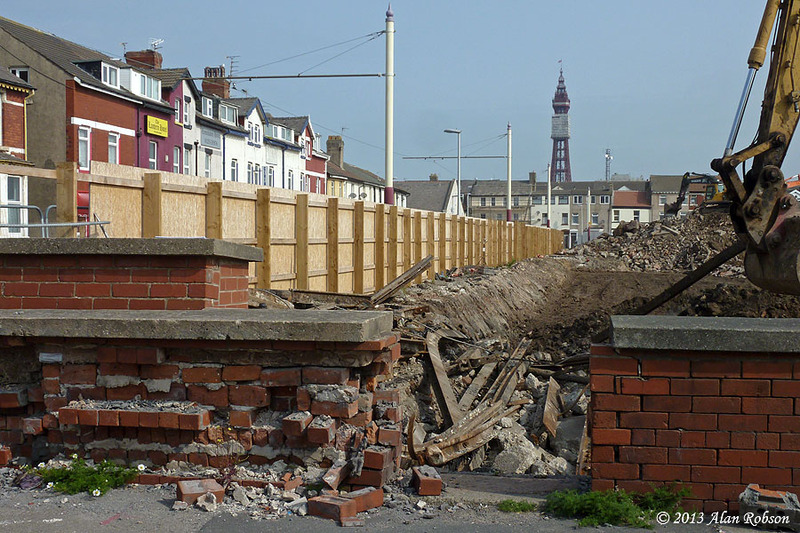 On entering the built up area of St Annes, the route takes a right turn down Todmorden Road onto the North Promenade, continuing past St Annes Pier onto the South Promenade, taking a left turn into Lightburne Ave at the Chadwick Hotel. 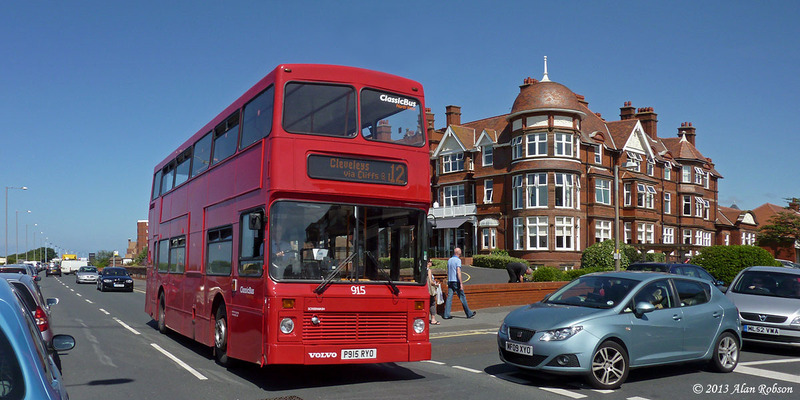 Another left turn is made at the end of Lightburne Avenue onto Clifton Drive, this time heading north-west to regain the original route by running past the sandhills and back to Blackpool. 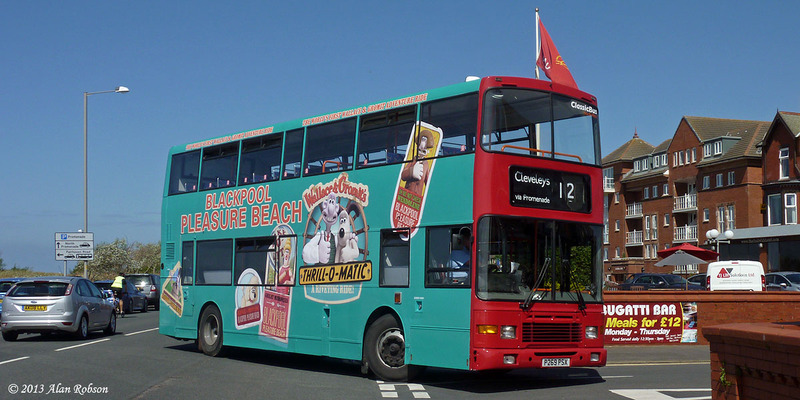 Ex Lothian Buses Volvo Olympian P269 PSX has received a new vinyl advert for the Wallace and Gromit themed "Thrill-O-Matic" ride, similar to the advert already carried by 12m Metrobus F69 SYE. 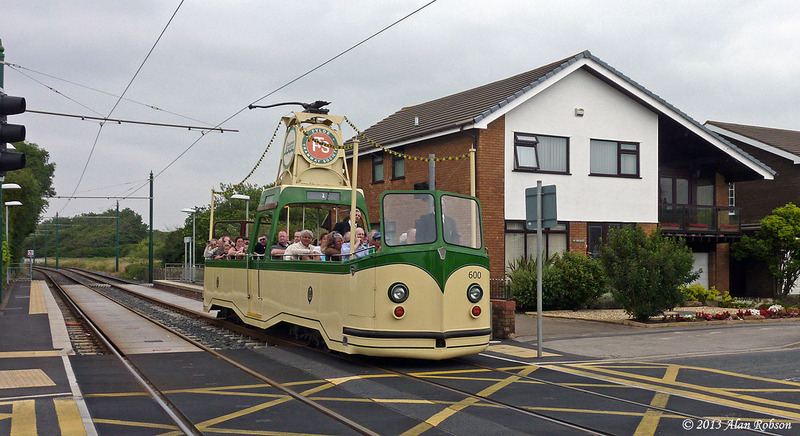 Open-top Balloon 706 Princess Alice was noted out on the tramway on test this morning, still displaying "Private Hire" on the blinds from when it was last used on Tram Sunday on 21st July. 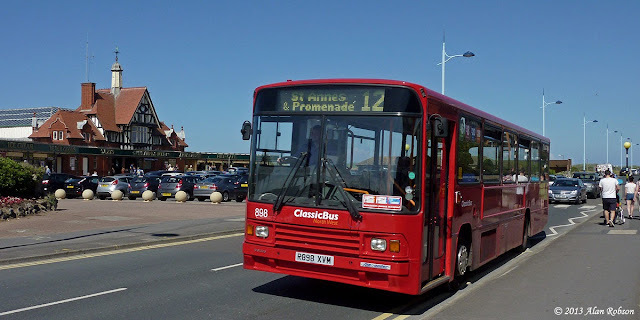 After the hot sunny weather that we've had for the last couple of weeks, Sunday 21st July turned out to be overcast with cloud all day. 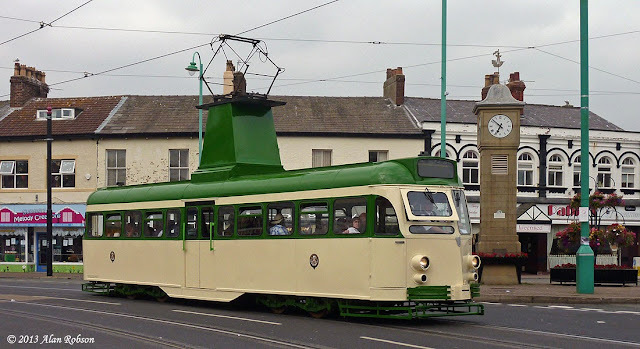 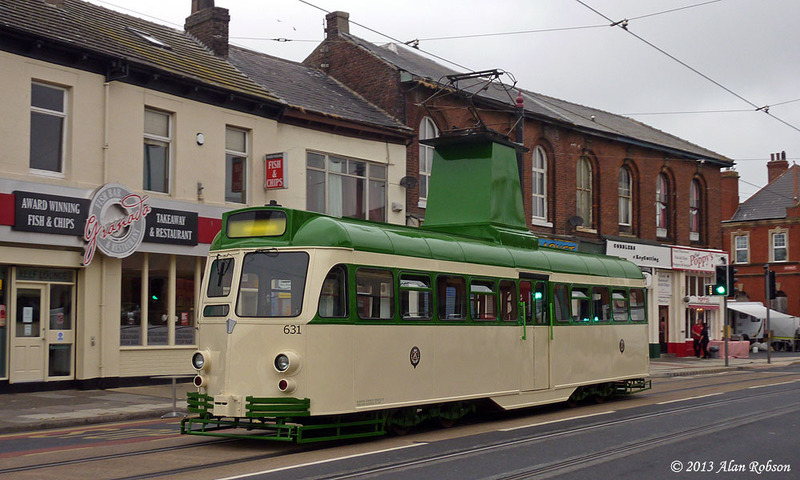 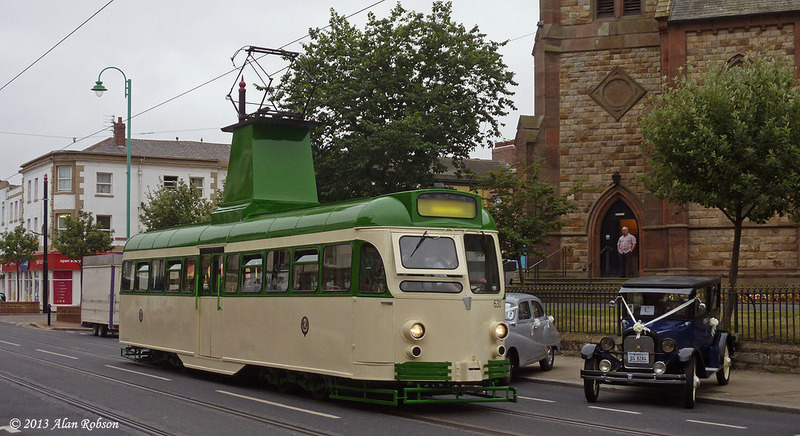 Spirits were not to be dampened by the dismal weather though as Tram Sunday saw the debut of Brush car 631, complete with modified paint scheme and wooden lifeguards fitted (to replace the snowplough type that it previously carried). 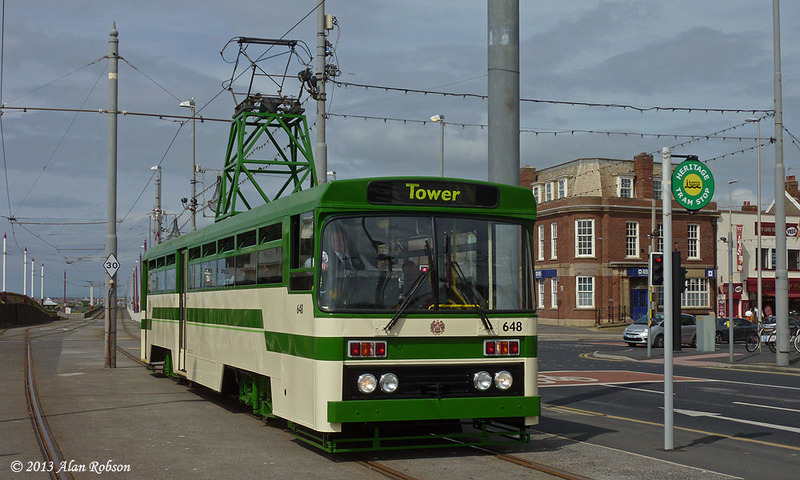 706 Princess Alice and Brush car 631 left the depot for an early start arriving in Fleetwood around 07:45, in order to take their places as static exhibits next to the lighthouse in Pharos Street. Boat cars 230 and 600 followed later on, with 230 picking up the civic dignitaries at North Pier, both trams proceeding to Fleetwood with 230 arriving at Ash Street at 10:30. 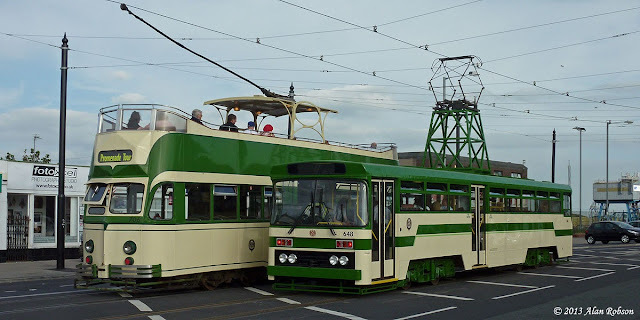 Unusually 230 stopped at the platform at Fisherman's Walk to unload its passengers, thus disproving the theory that it's unsafe for heritage cars to use the new Flexity platforms, as no passengers were to be seen falling down the tiny gap between the tram and the platform edge! 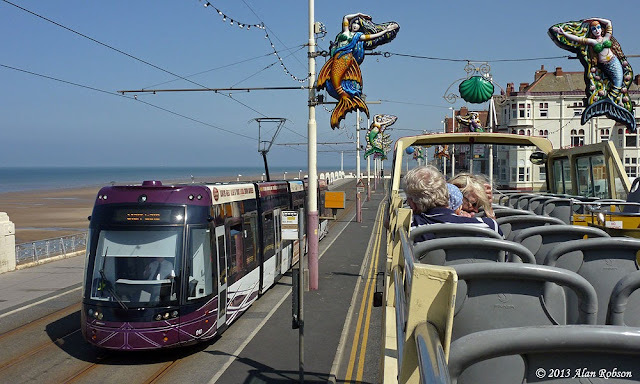 The Boat cars ran a circular tour between Ash Street and Thornton Gate during the day, and continued to use the northbound platform at Fisherman's Walk to unload their passengers, without any undue incidents being noted. 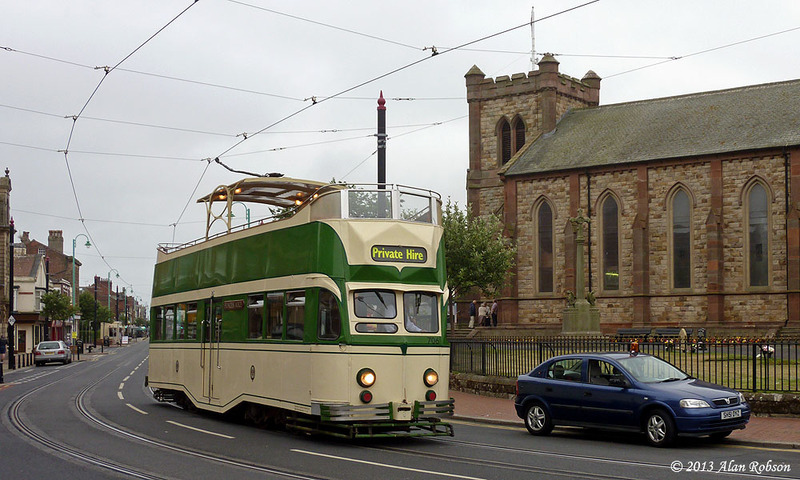 Throughout the day the normal Flexity service terminated and reversed at Fisherman's Walk, a process not made easy by the hundreds of people wandering over the tram tracks north of the crossover points in Lord Street. After the day's proceedings were wound up, 230 and 600 returned to Blackpool, with 631 and 706 having to wait until the roads were cleared and power restored to the overhead line on the Fleetwood street track. 706 and 631 departed from Pharos Street at around 18:50, to make their return journey in heritage service complete with passengers onboard to Blackpool. 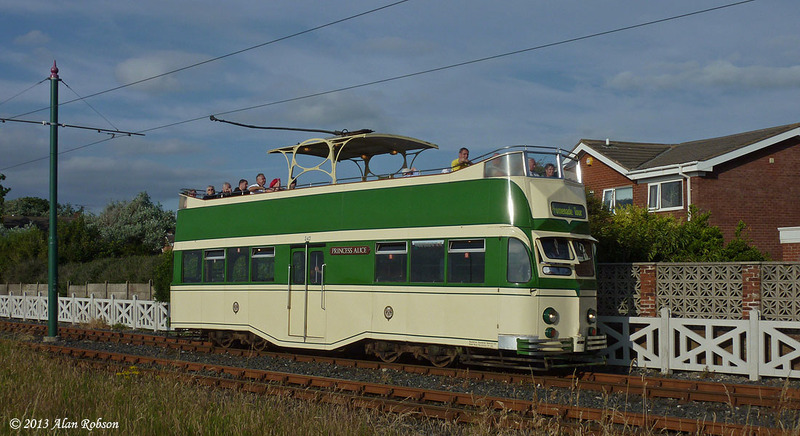 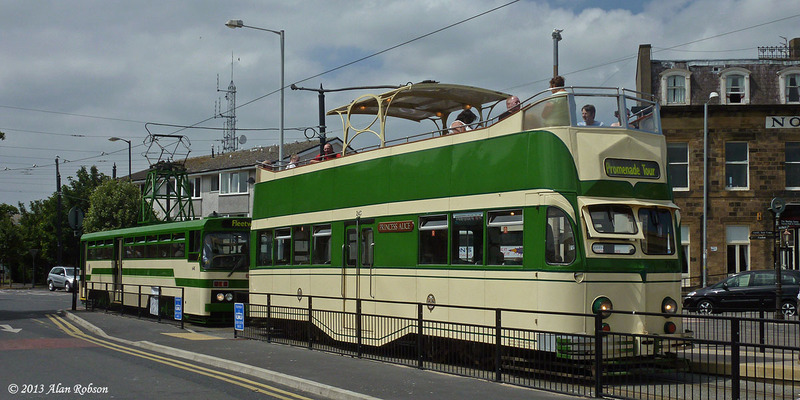 The Fylde Tramway Society ran a tour on 20th July using newly repainted Centenary car 648 and open-top Balloon 706 Princess Alice. 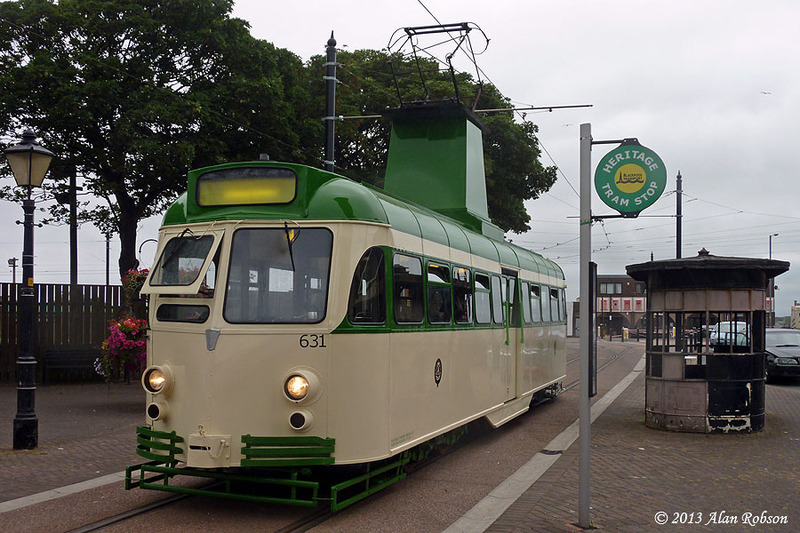 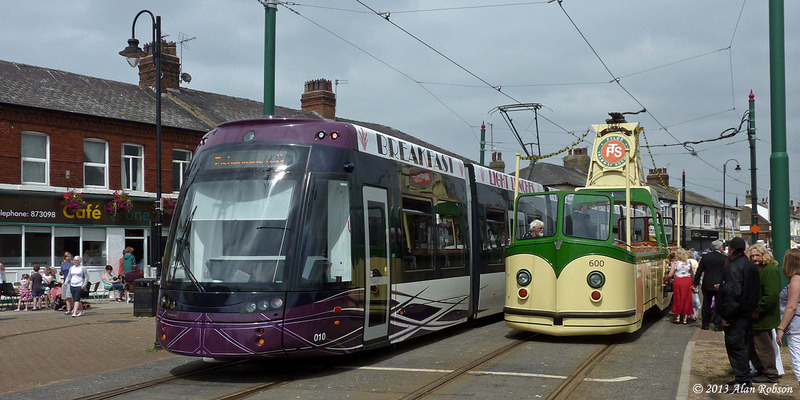 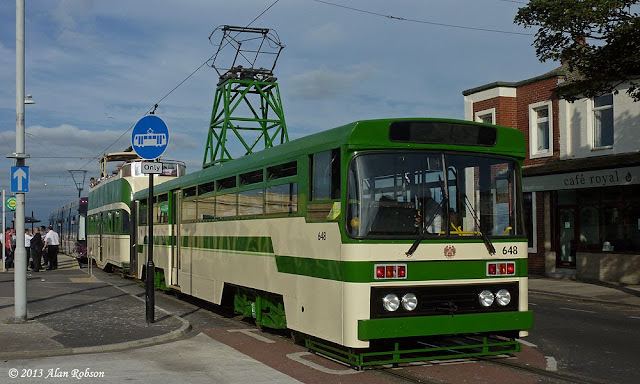 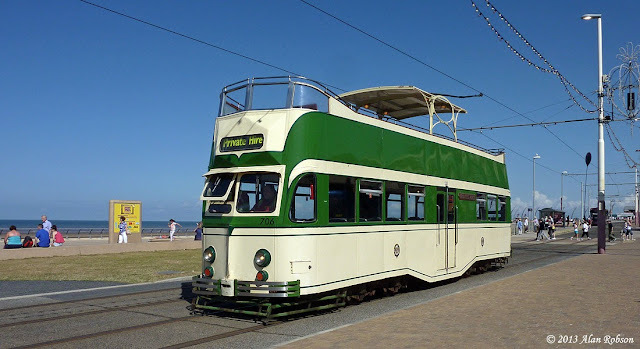 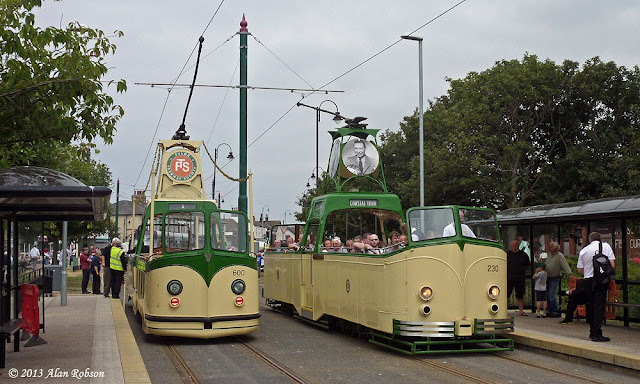 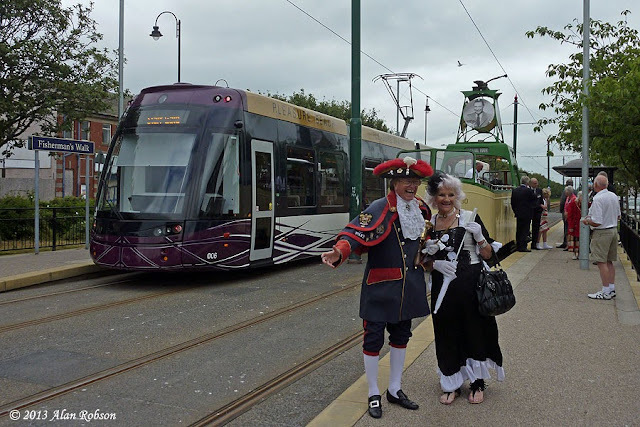 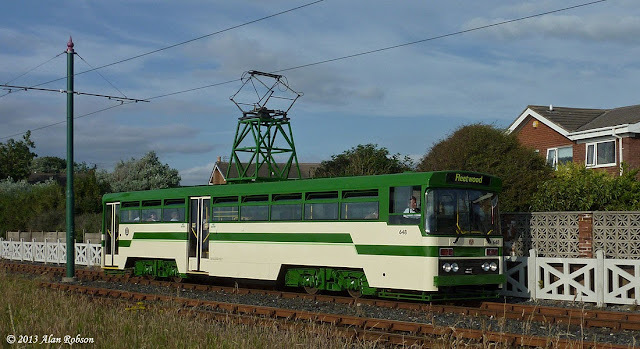 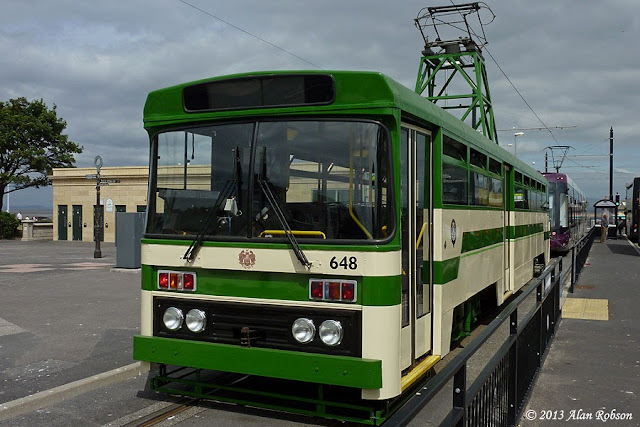 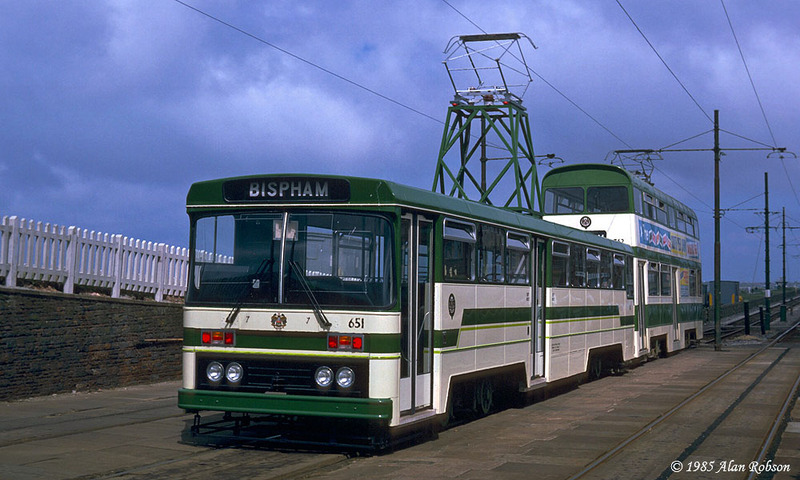 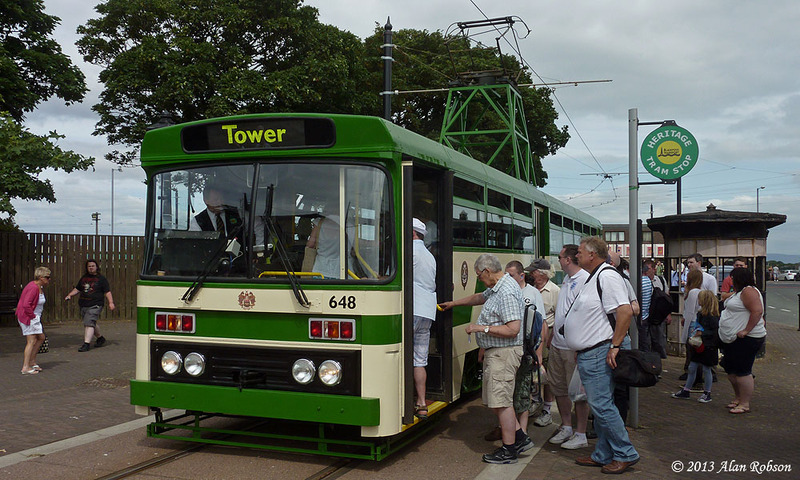 The format of the tram tour was that 648 and 706 departed North Pier at 12:00 and ran to Fleetwood together, on the return journey the trams split at Bispham, with 648 continuing to the Pleasure Beach and 706 returning to Fleetwood. 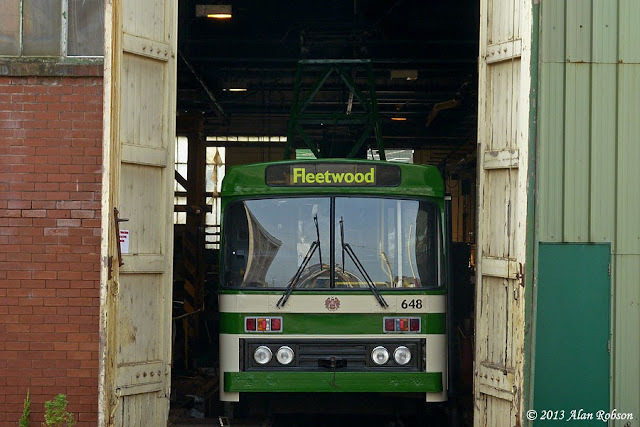 The rest of the day consisted of a timetabled Fleetwood to Tower shuttle service being run (although passengers could not alight at the Tower). The day wound up with both cars running their last trip together from Thornton Gate to Fleetwood, then back to Blackpool and returning to the depot after 7:00pm. 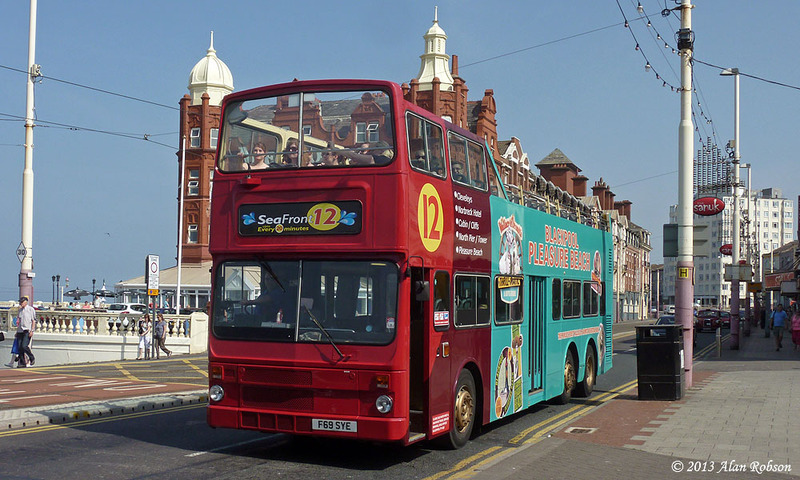 1988 ex China Motor Bus 12m MCW Metrobus F69 SYE (original fleet number ML81) has now been operating on the Seafront 12 service of Classic Bus North West for nearly four weeks, since 21st June. On 16th July it was decided that it was time to sample the delights of this massive vehicle, while the warm sunny weather is still with is. 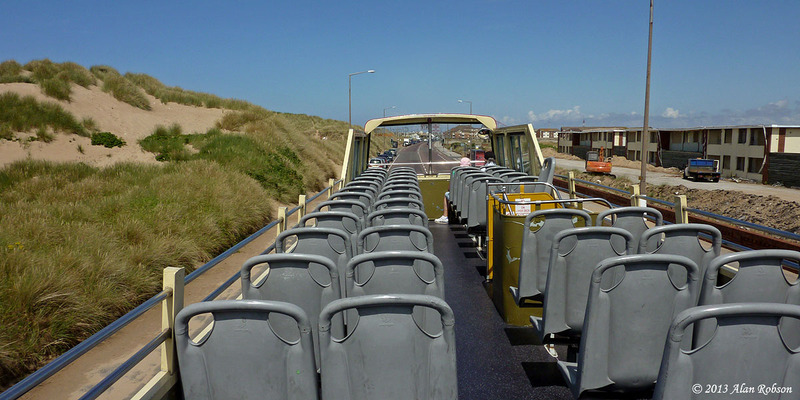 The Metrobus was fairly lightly loaded during the day, but this made it all the more pleasant for riding on the top deck with unobstructed views all around. 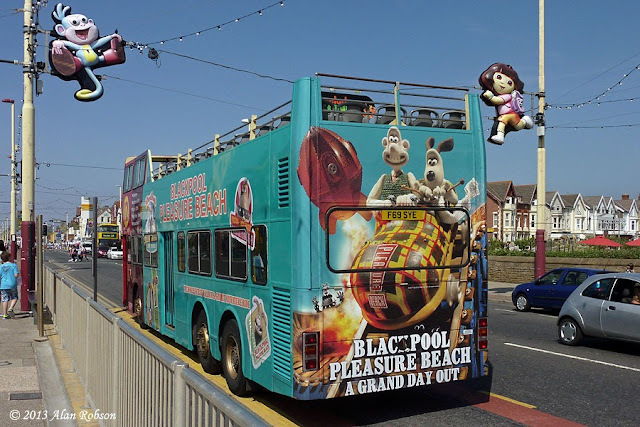 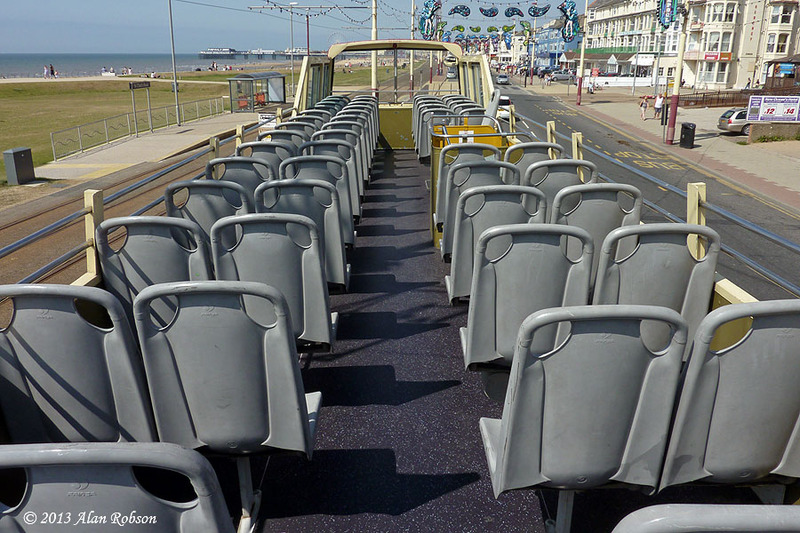 CBNW plan to extend the Seafront 12 service from the Pleasure Beach to St Annes with effect from 20th July. 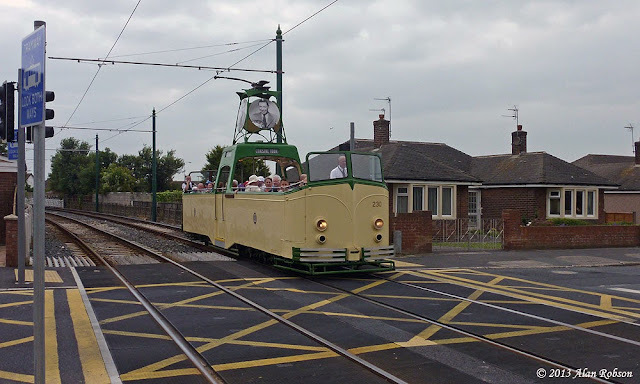 This selection of photos were taken on July 16th unless annotated otherwise. 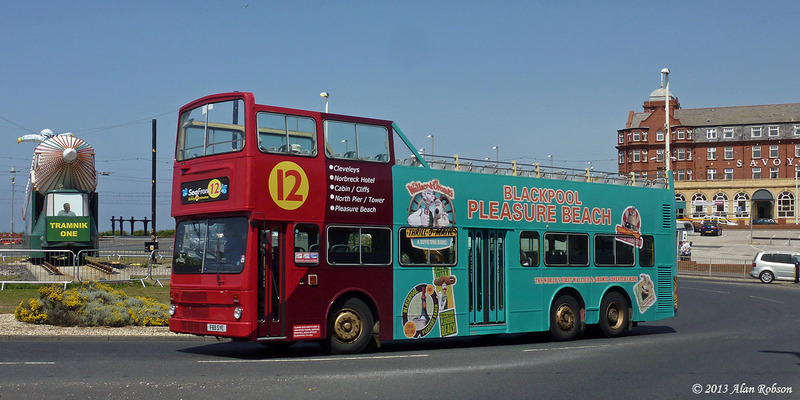 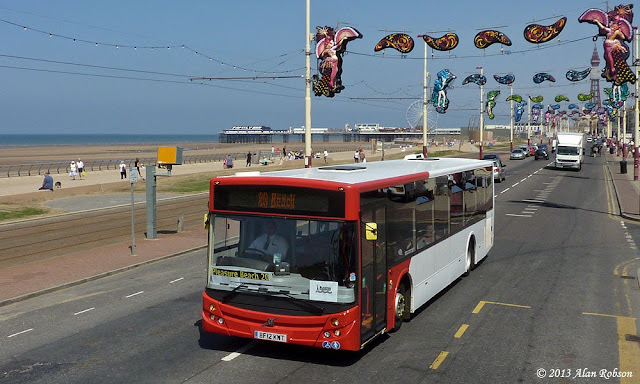 A Volvo B7RLE with MCV Evolution single deck bodywork is currently operating with Blackpool Transport as a demonstrator, and has been noted in use over the last couple of weeks on service 20 between the Pleasure Beach and Marton Mere. 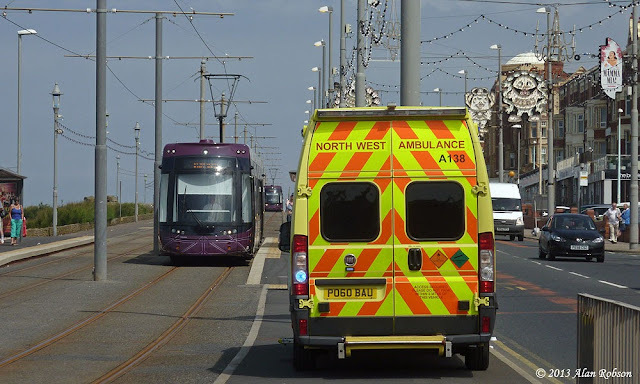 Shortly before midday on Saturday 13th June, Flexity 016 had just left the Gynn Square stop when a passenger fell over and hurt himself, requiring the tram to be suddenly stopped and an ambulance called for. When the ambulance arrived it pulled alongside 016 and the passenger was transferred from the tram to the waiting ambulance. 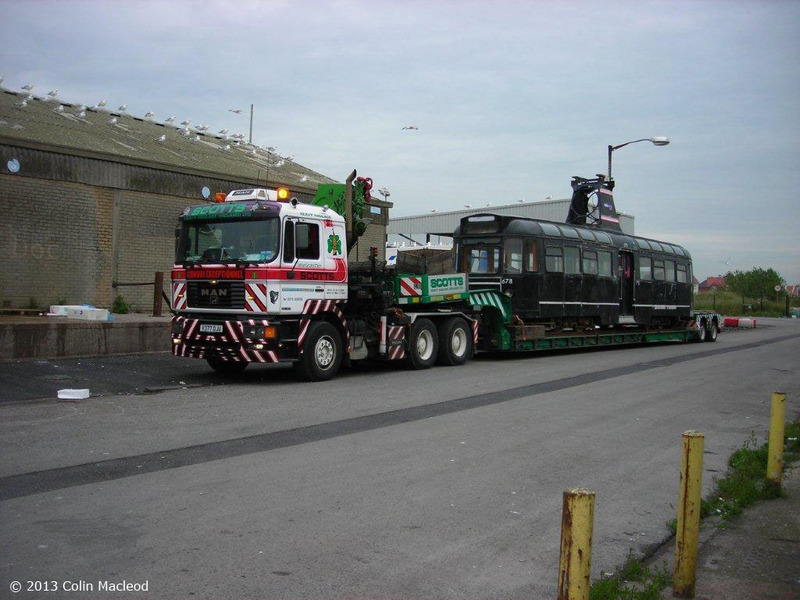 During the time that Flexity 016 had been waiting for the ambulance to arrive, and the tram finally being given clearance to leave by an inspector, quite a backlog of service cars had built up behind it. Six Flexity trams passed Gynn Square southbound within the space of 10 minutes between 11:58 and 12:08, ie 016, 008, 003, 009, 004 and 006. 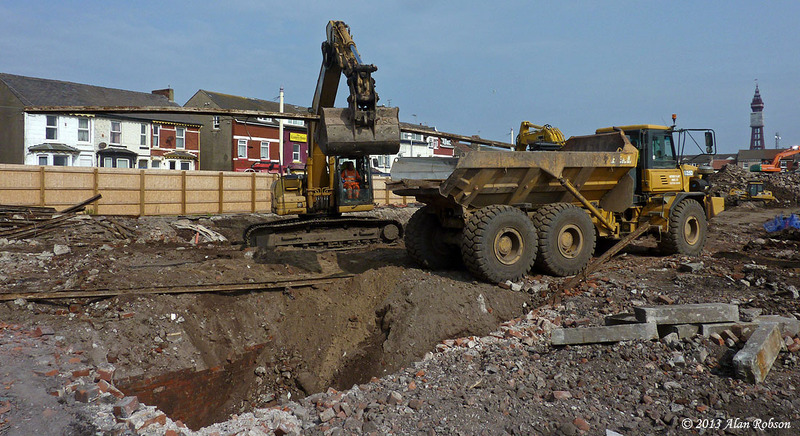 The final visible signs of Blundell Street Depot are now beginning to disappear as the demolition process draws to a close, part of the end wall and a cellar are all the remain of the brickwork still in situ. Today saw many of the old rails being loaded onto dumpers for removal from the site, some of these rails are being given to the Fleetwood Heritage Leisure Trust for use in their projected tram museum project in Fleetwood. During the demolition process an underground room was discovered at the Rigby Road end of the building after a digger fell through the concrete roof, the cellar room contained what appeared to be ammunition. In view of the potential danger a bomb disposal unit was dispatched to the site, and Rigby Road was cordoned off for four hours. 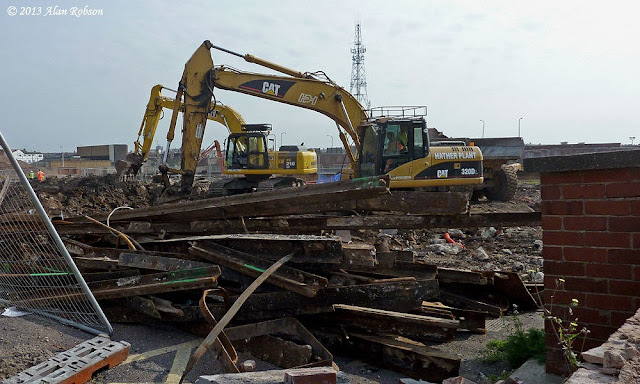 It turns out that these were empty First World War shell casings, as part of Blundell Street depot had been used for producing munitions during WWI. 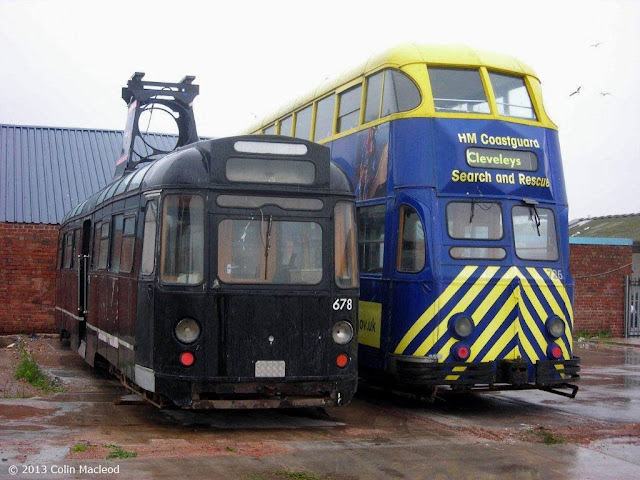 Centenary car 648 was noted receiving attention in the fitting shop at Rigby Road depot today. 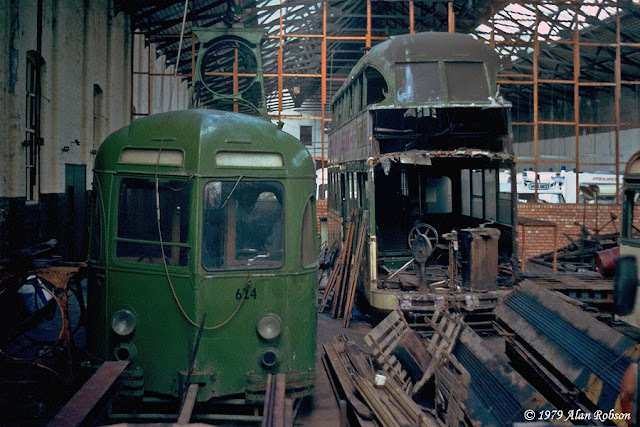 The cab end of 648 was visible through the open doorway from Blundell Street, showing that further work has progressed since it was on display in a partly painted condition on Hopton Road on 25th May. The end detailing of the cab is almost finished, with a bumper now fitted and the paintwork with Corporation crest nearly completed, apart from the pale green lining which is still absent. 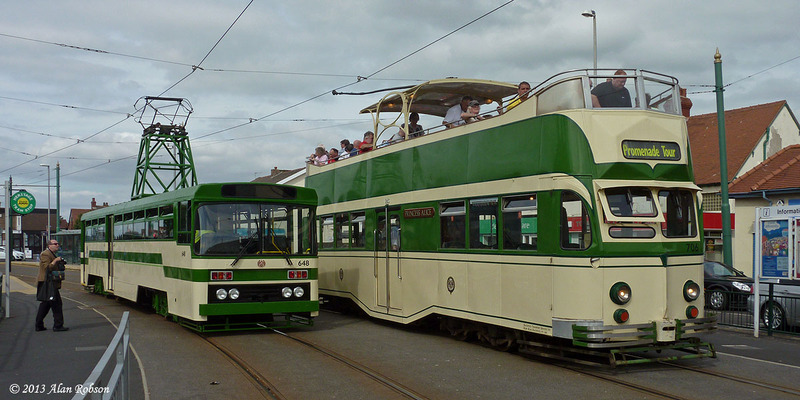 648 is due to make its public debut on the FTS "Back to the Centenary" tram tour on Saturday July 20th. 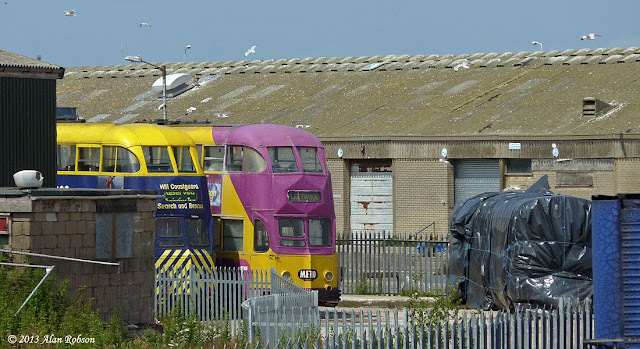 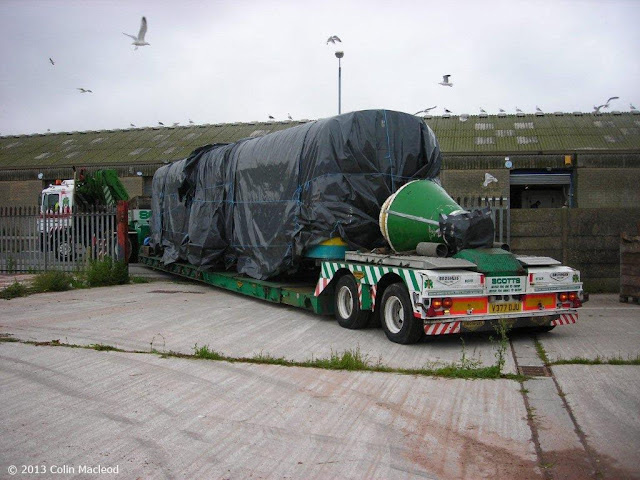 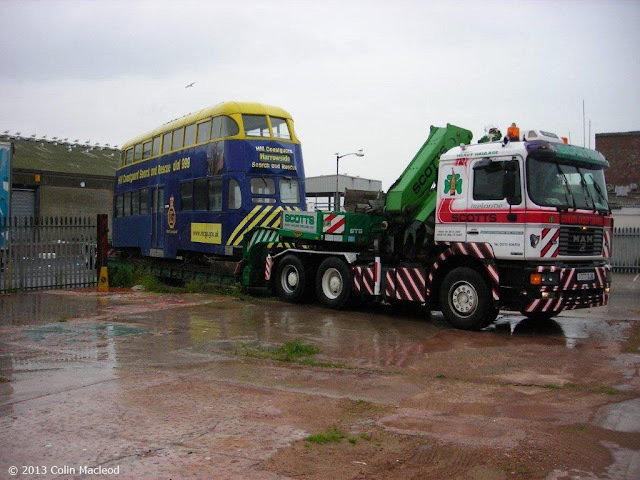 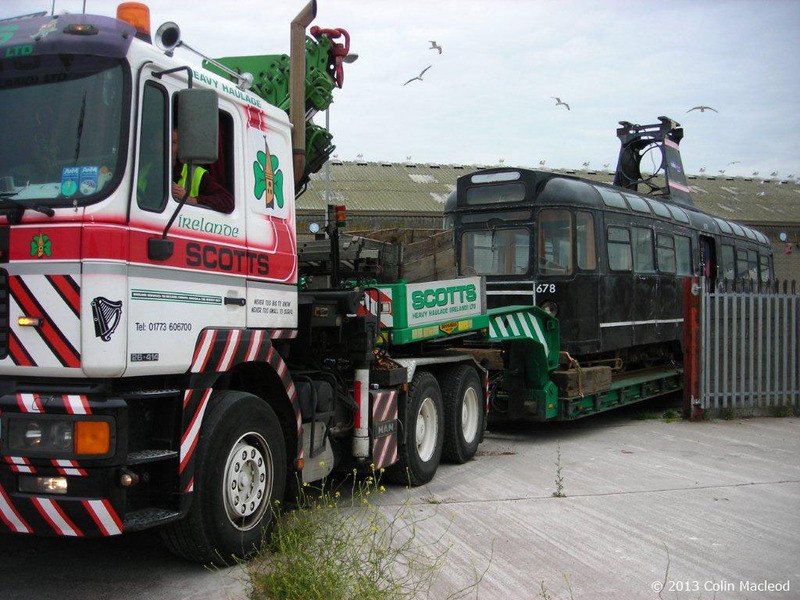 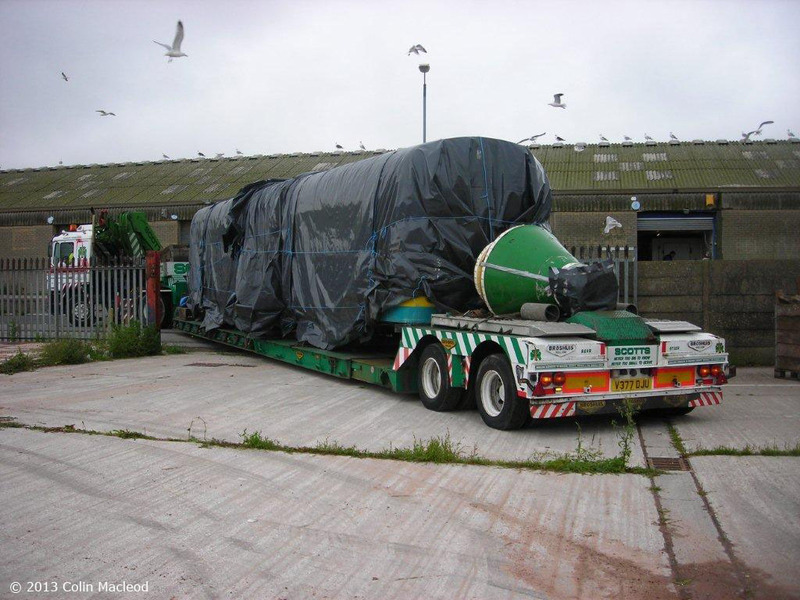 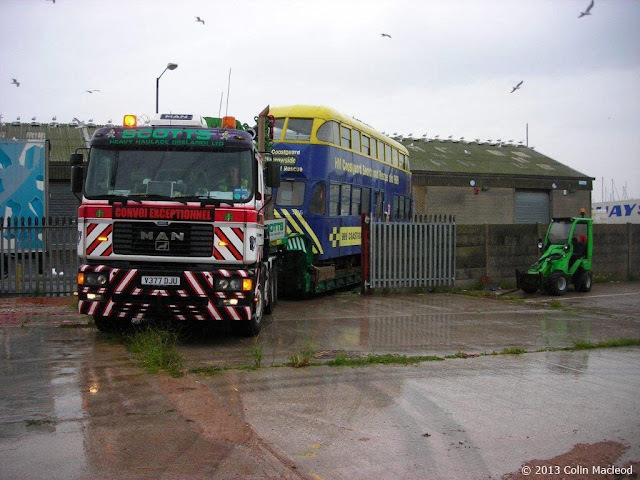 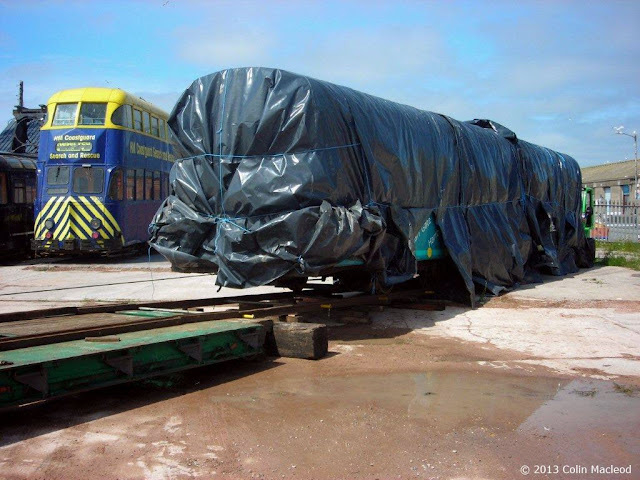 Thanks to the kind courtesy of Colin Macleod, a series of photos are reproduced below showing the four Fleetwood Heritage Leisure Trust trams after they had arrived in the Associated British Ports fish docks at Fleetwood on the 2nd and 3rd July.